MSA has been in the business of safety at height since 1930, and today it is at the forefront in both the supply and range of innovative fall protection products. MSA is truly a global manufacturer of fall protection, with major manufacturing plants in North and South America, Mexico, China and United Kingdom, complemented by distribution hubs throughout the world. Our extensive product range include the innovative V-Series range of SRLs and PFLs, engineered lifelines with our MSA Latchways® range, selection of textile products and confined space equipment. These are complemented by MSA rescue products, to ensure workers at height have the protection they need at all times. The MSA Latchways fall protection range is used around the world in all manner of industries and locations, with our engineered systems used on tall buildings and structures as diverse as office blocks, industrial units, airports, leisure and retail complexes, stadiums, telecommunications towers and electricity pylons. The products themselves are innovative in their design and manufactured to the highest quality. In turn, a global network of specialist registered partner companies provides the assurance that product quality is matched by equally high standards of specification, supply, installation and maintenance. MSA SRLs are unique — MSA has totally re-engineered the method by which SRLs function, creating additional safety features and enabling complete field serviceability, lower cost of ownership and reduction of downtime. MSA offers two unique absorber technology platforms: the Radial Energy Absorber utilising our patented tolerance ring absorption technology in our V-Series platform and Constant Force® absorption using a simple stainless steel coil mechanism that absorbs energy in the event of a fall in our Standard SRL range. The Standard SRL also uses the 100% reliable Full Contact™ pawl locking mechanism which creates an audible click that can be felt while in use, indicating correct system operation. Cable and hook assembly components generally see the most wear, so all Latchways units enable simple cable replacement within minutes. Furthermore, if a fall occurs, energy absorbers are easily replaced, allowing SRLs to be safely returned to service. Training for this and the other simple service techniques are available free of charge from MSA, avoiding costly complete factory rebuilds. MSA has launched its new V-TEC™ self-retracting lifeline (SRL) which revolutionises the way we use Fall Protection PPE in the field. It is the first in the market to include an in-built retraction dampener which allows the user to release the cable safely via controlled retraction; this prevents potential injury to the user and damage to the main body of the unit. It also offers safe operation and a reduction in costs and downtime. In addition to the in-built dampener, the V-TEC also benefits from patented radial energy-absorbing technology which ensures control over any force exerted on it. Together, the radial energy absorber and dampener translate the latest technology into ease of use, inspection and maintenance. Its construction is based on an award-winning design first used in the MSA Personal Fall Limiter. A clear outer casing allows instant inspection and peace of mind, while the radial energy absorber requires no calibration or adjustment before use. A convenient carrying handle is fitted for easy transport. The V-TEC SRL is made using stainless steel and engineered polycarbonate plastics for great durability and, when necessary, its cable, energy absorber and retraction dampener can all be quickly replaced on-site. A choice of galvanised or stainless steel cables is available to meet the needs of different environments and applications. 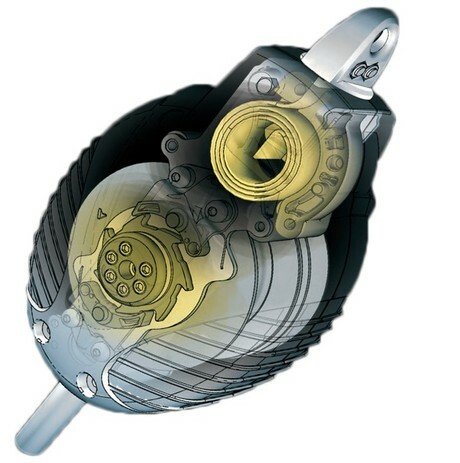 With premium stainless steel components and innovative engineering, the V-TEC Self Retracting Lifeline incorporates a precision-made spring radial energy absorber that requires zero calibration or adjustment. What makes the MSA V-Series SRL/PFL so unique? Inserted into the device under 500 psi of pressure and manufactured from high-quality stainless steel, the tolerance ring used in the MSA V-Series SRLs and PFLs has a series of ‘waves’ around the circumference serving as individual radial springs. Under an energy/load transfer during a fall, these ‘springs’ create friction between the mating components, arresting the fall and reducing the forces on the body. The tolerance ring is a precision pre-engineered integral energy absorber, constructed of preformed spring steel. The profile of the tolerance ring consists of precision pre-formed ridges around its circumference. When mated between the bronze inner and stainless steel outer (brake pawl holder) it creates a constant level of friction which maintains a consistent calibration. The holding ability of the tolerance ring is the resultant force of all the waves and the coefficient of the friction with the mating parts. In the event of a fall, the pawl locks onto the chassis and the drum then rotates independently. The friction created by the waves of the tolerance ring sliding between the brake pawl holder and the overmoulded drum consequently acts as an absorbing brake limiting the force to below 6 kN. Using the multiple spring radial energy-absorbing technology, this patented design eliminates the need for an external energy absorber outside of the housing, resulting in the most reliable and effective self-retracting lanyard on the market.